Show players what traits are vital in this new world, so that their heroes – whether created with GURPS After the End 1: Wastelanders or something else – can survive and thrive here. Learn about the unique hazards specific to certain apocalypses. Face toxic chemicals, deadly weather systems, plagues, bizarre gangs, mutated animals and plants, nanobots and robots, paranoid paramilitaries, radioactive craters, or zombie mobs – though usually not all in the same game! Knowledge is power – and this is true whether you're fighting androids left over from the Great Human-Robot War, slaying zombies spawned from the glowing meteor that hit Earth, or trying to survive the hyperstorms and neo-druidic gangs now that Mother Nature has declared war on humanity. So think of this as your atlas to the wasteland, helping you live another day as you explore this dangerous new world! 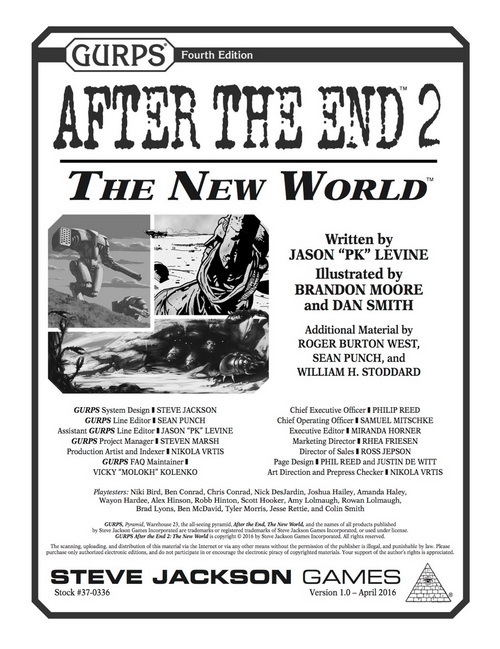 Check out the full GURPS After the End line for more post-apocalyptic action! Add giant robots to your campaign with GURPS Reign of Steel: Will to Live, a Fourth Edition update for the GURPS Third Edition post-apocalyptic campaign sourcebook GURPS Reign of Steel. 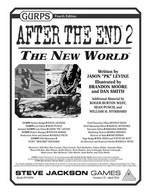 Get inspiration for plotting the end times with GURPS Y2K, for Third Edition. Get the edge you need with rules for diplomacy, trading, or mobs with GURPS Social Engineering. Shake up the heroes' expectations with mutations, exotic diseases, and strange drugs, thanks to GURPS Bio-Tech. Liven up the wastelands with the shambling dead, with GURPS Zombies!